Join us for our annual spring concert! 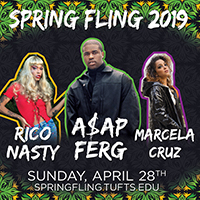 Spring Fling 2019 will feature live music by A$AP Ferg, Rico Nasty and Marcela Cruz. Free pizza and water will be provided. Show starts at 12pm and DOORS CLOSE at 3pm. 18+ Guests of Undergraduate Students (Up to 2): $30 (+ $5.00 credit card fee if online) until gates close or until sold out. Limit of 2 guest tickets per undergraduate student. You are required to enter the name of your guest when purchasing a guest ticket. If you need to update your guest ticket name, visit bit.ly/sfguest19. Graduate Students: $30 (+ $5.00 credit card fee if online) until gates close or until sold out. Faculty/Staff: $30 (+ $5.00 credit card fee if online) until gates close or until sold out. ID Required: All students must have valid Tufts Student ID. All guests must have valid government issued photo ID. Security Screenings: All concertgoers will be subject to security screening, including metal detectors. Staff and security reserve the right to inspect and/or refuse the admittance of any person or item. Entrance: Enter through the Academic Quad, between Ballou Hall and the Chapel OR between Ballou Hall and Barnum Hall. Gates close promptly at 3:00pm. Valid Tickets: Tickets will be scanned at the entrance, and names on the ticket AND scanner MUST match the name on your Tufts Student ID. Tickets are non-transferrable. There is no re-entry into the show. No exceptions. All guests must be 18 years of age or older, and the names of your guests must be entered when purchasing your guest tickets.